Stocks finished with slim gains Monday, recovering from the worst week of the year, as technology and energy stocks lifted the broader market. The Dow Jones industrial average rose 0.1%, the S&P 500 edged up 0.5% and the tech-heavy Nasdaq gained 0.9%. 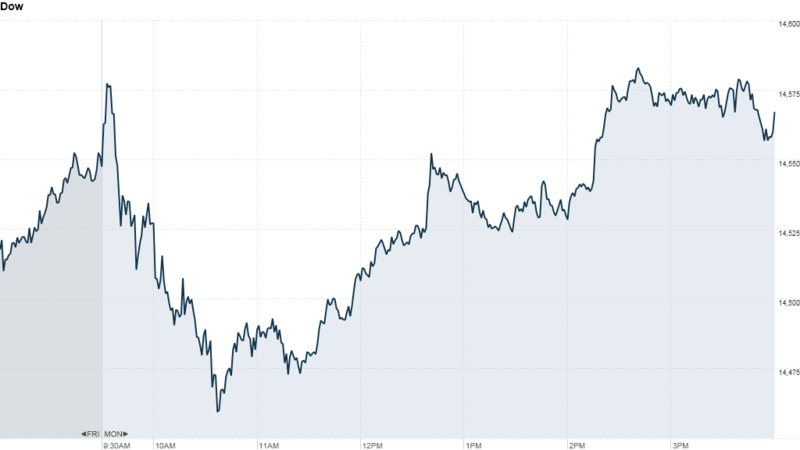 Among tech shares, Microsoft (MSFT) was a big gainer. Shares rose almost 4% to a seven-month high after ValueAct CEO Jeffrey Ubben confirmed to CNNMoney that the hedge fund planned to take a nearly $2 billion stake in the company, making it one of Microsoft's biggest shareholders. CNBC had earlier reported ValueAct's plans. Netflix (NFLX) shares rallied almost 7%, making it the biggest winner in the S&P 500 and Nasdaq 100. Shares continued to rally in after-hours trading after the company trounced earnings expectations on more than $1 billion in revenue, a sign that its original "House of Cards" video series is paying off. Energy giant Halliburton (HAL) shares jumped almost 6% after it handily beat earnings and revenue estimates. Caterpillar (CAT) shares climbed almost 3% after the company announced that it plans to buy back shares for the first time since 2008. 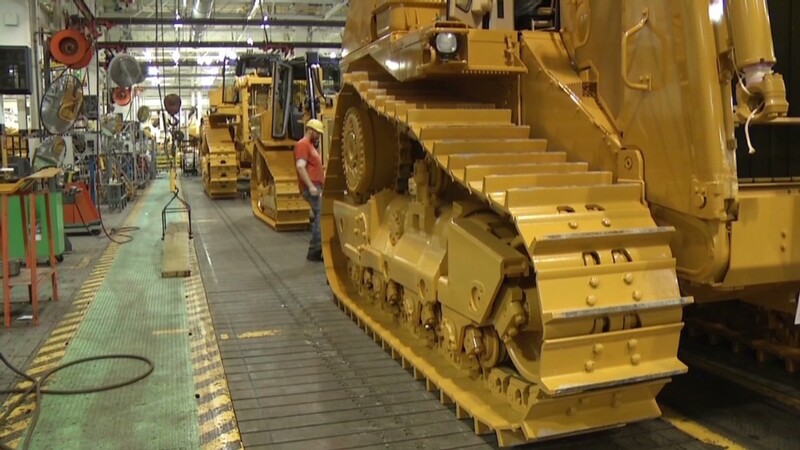 That plan overshadowed Caterpillar's worse-than-expected profit and revenue, as well as its weak outlook for the year. Analysts expect earnings for S&P 500 companies to rise by 2% for the first quarter, according to S&P Capital IQ. But earnings season is far from over. So far, 107 S&P 500 companies have reported, with 72 beating forecasts, 24 missing and 11 coming in in line. Aside from earnings, shares of Power One Inc. (PWER) surged more than 50% after Swiss company ABB (ABB)greed to buy the solar power company in a $1 billion deal. On the downside, General Electric (GE) shares dropped nearly 2% after JPMorgan Chase downgraded the stock to neutral. Earlier in the day, stocks were mixed as investors reacted to a lackluster report on the housing market. An industry report showed that existing home sales slipped 0.6% in March from the prior month. Analysts expected the sales rate to rise. Gold was also back in the spotlight. After last week's rout, the precious metal was up almost 2%, to $1,421.20 an ounce. That helped push the SPDR Gold Shares Trust ETF (GLD) up almost 2%, and shares of gold miner Randgold (GOLD) spiked nearly 5%. European markets finished little changed, amid hopes that Italy may soon have a new government after President Giorgio Napolitano was elected for a second term. Asian markets ended mixed, with the Shanghai Composite declining 0.1% and the Hang Seng adding 0.1%. Japan's Nikkei rose 1.9% and the yen fell to almost 100 against the U.S. dollar after the G-20 gave its blessing to Japan's new monetary policy experiment. Oil prices edged slightly higher. The price on the 10-year Treasury edged up, pushing the yield down to 1.69% from 1.70% late Friday.